A trip to Sharon, Pennsylvania had been on my list of places to visit for quite some time for no other reason than the fact that the Buhl Mansion Guesthouse and Spa is located there. Other than that, I knew little about the small town located approximately 75 miles northwest of Pittsburgh. As I considered visiting the mansion, I embarked upon a bit of research and learned that the imposing, fortress-like structure is not only listed on the National Register of Historic Places, but is also among America's Top 10 Romantic Inns.What's not to love? Over the years, I'd forget about it, only to be periodically nudged by a Facebook post here and there. Eventually, I decided to drop a few hints to my husband. He demanded to know more about why we should visit the area and I came up lacking. All I know is that I adore old castle-like structures and witnessing its elegance firsthand would be a lovely anniversary present, so, like the sweetheart that he is, he gave in and we set out to explore the area this past October. It turns out that the little town of Sharon holds many surprises. When we pulled up to the Buhl Mansion, I was stunned to learn that the B&B is situated in a residential neighborhood. And to think that all this time I was envisioning a rural, out-of-the-way area in some remote countryside. It's difficult to conceive of it any other way when viewing the website, but this turned out to be a good thing due to its proximity to the downtown shopping area. The Buhl mansion was built in 1891 for the Buhl family that ran Sharon Iron Works. Yale-educated Frank H. Buhl left his home in Detroit in 1887 to help his father run the business. It turns out that Frank had a certain business savvy because just one year later, the company became Mercer County's largest employer. Buhl then went on to found the Buhl Steel Company in 1896, which merged into the National Steel Company three years later. He eventually became known as the "Father of the Industrial Shenango Valley" and shortly before his retirement, the National Steel company merged into the United States Steel Corporation. Buhl and his wife Julia Forker had no children of their own but were happy to use their considerable fortune to help support the children of their community. A list of their philanthropic and business endeavors hangs on the wall near the dining room of the mansion. The 2.5-storey residence is done in Richardsonian Romanesque style and made of ashlar sandstone, featuring round arches and several turrets with copper-capped spires. Unfortunately, the home fell into disrepair after years of neglect. The property caught the eye of Jim and Donna Winner, a local couple with a passion for saving historic landmarks. In 1996, they decided to restore the structure to its former splendor and embarked upon a multi-million-dollar renovation. Today the beautifully appointed inn touts 10 well-appointed guestrooms and a full-service spa. The foyer of Buhl Mansion. A stained-glass window on the second floor. Bronze statues in the first-floor sitting area. Photo taken from the second floor. Mike relaxes in a comfy, over-sized chair in the breakfast room. After settling in, we ventured out to explore Sharon. We began by visiting a nearby candy shop, intrigued by its mid-century modern flair. Daffin's Candies was established in 1903. I learned that Daffin's candies is a local favorite and that the original family store opened in 1903 in Woodsfield, Ohio. Today's 20,000 square-foot store in Sharon now serves as their flagship location. 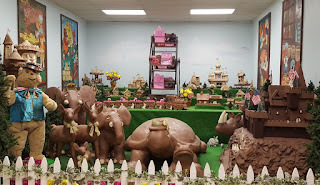 Daffin's makes more than one million pounds of chocolate annually and sells approximately 600 different candy creations, including their Caramel Pecanettes, which are followed by the Melt-A-Ways and the Cordial Cherries in popularity. 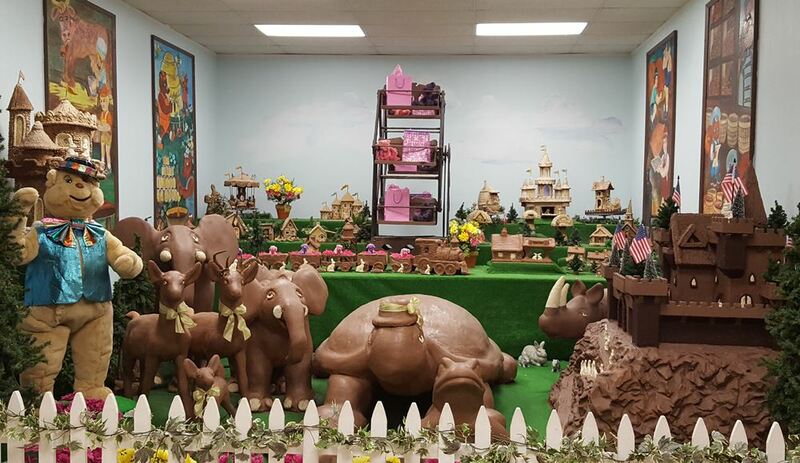 Daffin's in Sharon is also known for its "Chocolate Kingdom," which includes a 400-pound turtle, a 125-pound chocolate reindeer and a 75-pound chocolate frog. The store carries a selection of cards and unique gifts, as well. Daffin's is within walking distance of the Buhl Mansion, but if you care to explore downtown, it's but a two-minute drive away. There you'll find a variety of stores selling everything from shoes, to jewelry, home goods, furniture and apparel. The town of Sharon is known for proudly displaying its patriotism all year round and flags are seemingly everywhere. The one in the above picture welcomes visitors to the area. A Monument to Iwo Jima. Our first retail stop was driven by curiosity. Reyer's Shoe Store purports to be "America's largest shoe store." I can't verify that claim, but I can attest to the fact that they have a nice selection of shoes in many different styles and sizes. They also feature clothing, costume jewelry and accessories as well. The real surprise, however, was when I learned that employees are on standby to help not only with selections, but sizes as well. They actually measure customers' feet, just like in the "old days." That "mid-century" theme was repeated throughout the town as we made our way through the stores and streets of downtown Sharon. "It's a Wonderful World" sculpture was made possible by a partnership with artist Alexandra Knight, the city of Sharon and the local school district. Donna's Diner has a 1950's malt shop feel. Laskey's Furniture building with its 1950s-era facade. 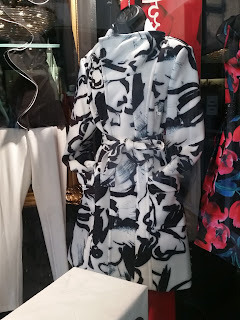 I especially enjoyed browsing among the clothing at "The Winner," which reminded me of the department stores of yore where the focus on service was paramount. The 75,000 square foot store features ladies fashions and accessories. I read that Jim and his wife Donna designed it so that it would be an affordable women's wear outlet, but with a more upscale atmosphere like that of a Nordstrom, or Saks. It isn't often that you see a piano and chandeliers in a department store these days. If you visit, be sure to take the elevator to floors two and three to view even more merchandise. Plenty of saleswomen will greet you as you browse. I took advantage of their keen eye for a bit of feedback on my would-be purchases. The elegant interior modeled after Nordstrom and Saks. Of course I couldn't leave without buying something. I ended up with this snazzy coat and the icing on the cake was that "The Winner" offers veterans a 20 percent discount, so my husband got a break on the price. Jim Winner was a proud veteran, which leads me to another fun fact. He was also the inventor of the anti-theft device known as "The Club," with sales that exceed 30 million units. Winner came up with the idea after his own car was stolen. Like I've said before, Sharon is full of surprises. A Samuel Dong coat I purchased at "The Winner." Speaking of surprises, never before have I seen a men's lounge in a department store. Is this another nod to a bygone era? Was this a standard feature in department stores of the past? Maybe someone out there can enlighten me because I really have no idea. Nonetheless, I think every store should have one. A men's waiting room, complete with television and newspapers so women can get their shop on unimpeded. Another highlight of our trip to Sharon was a visit to Tara-A Country Inn, in nearby Clark, Pennsylvania. The Winners called it "a deal of a lifetime" when they purchased the 1854 property at auction. After two years of extensive renovations, the inn opened to the public in 1986. Today it features 27 guest rooms and several restaurants, including "Stonewall's Tavern" where we enjoyed a cozy dinner. Stonewall's Tavern won a "Wine Spectator Award" for having one of the most outstanding restaurant wine lists in the world. Stonewall's Tavern is located on Tara's lower level. Antiques and "Gone with the Wind" memorabilia were tucked into every nook and cranny, which made the Inn a great place to explore and best of all, no one seemed to mind as I snapped picture after picture. One of the many antiques at Tara. A long hallways leading to accommodations. In keeping (Innkeeping?) with the theme of "Tara," rooms are given names reminiscent of the classic movie like "Rhett's Room," "Belle's Boudoir", "General Robert E. Lee's Room" and so forth. I noticed that some were open and unoccupied, so I took the opportunity to snap a few shots. I have to say that Sharon, Pennsylvania might not be the richest area in terms of money, but it more than makes up for that with its quaint charm. And along the way I learned a little more about the history of the area and a couple by the name of Jim and Donna Winner. Thanks to the invention of the "Club," they were able to save historic landmarks and put their unique spin on them while giving back to their community, not unlike philanthropist and businessman Frank H. Buhl, who would no doubt be proud. Thank you! I loved the pictures and text. It was wonderful to see my old hometown again. I haven't been back since 1971. Remarkably, it looks largely unchanged. Thank you--it was a bit like stepping back in time, very quaint area. Is the Winner the former Strauss store? Yes or the Sharon Store, with many of those features intact. Visited Tara this last fall and loved it. The Sunday brunch is amazing and very affordable. I really would like to visit again and not miss The Buhl Mansion and quaint town this time. Sounds like an overnight stay may be in order. Thank you so much for writing this! As a former Sharon-ite, it was fabulous to read an outsider's take on the town I grew up in. I used to walk to Daffins when I was younger. Their peanut butter filling was the best, better than Reeses. Thanks everyone for the comments. It was a pleasure to write. Does anyone remember the McBride funeral home? They were my great grandparents - the house was torn down in the 1980s. I visited mansion guesthouse and spa this last fall and loved it. It was wonderful place. The room service is very good. who owns sidewalk in front of house..